January 29 2015 marked the centenary of the first group of German Prisoners to arrive at the Leigh POW Camp, the camp originally built for the Lilford Weaving Company Limited, was close to both Etherstone and Lilford Street. The camp caused great interest in Leigh and crowds of local people lined the streets to witness the arrival of the POWs. The POWs stayed at the camp until 1919 although little is known about their time there. Remaining records including newspaper reports and photographs show some of the POWs forming theatre groups, playing sports and card games. Some of them worked at the Partington Steel Works in Irlam. Around 12 prisoners are believed to have attempted to escape from the camp one of which ended tragically when one prisoner, Friedrich Wilhelm Karl Schmidt, was shot and killed whilst trying to escape via the roof of the camp. Friedrich was buried in Leigh Cemetery as were 12 other prisoners who died from a number of diseases including the influenza epidemic of 1918, heart disease and typhoid fever. An obelisk was erected over the grave with a memorial inscription carved on it by the POWs. Both the prisoners and the obelisk are no longer in the cemetery (the men who had died were moved to German War Graves Cemetery at Cannock Chase) and there are no physical reminders of the camp apart from the cottages the guards used. After the war the camp returned to its original purpose of weaving but it too ceased production in the 1960s and the building is no more. There are people today in the local area who have had stories passed down through their families about the camp and it still causes great interest today, as the POWs and the camp have been the subject of plays, a radio documentary and a book by Leslie Smith called “The German Prisoner of War Camp at Leigh 1914 – 1919”. After a public consultation in January 2015, it was suggested that the best way to commemorate the camp, POWs and the guards and staff who worked there, was to ask local children to design a memorial. Schoolchildren from Leigh and the surrounding townships entered a competition to create a winning design. The memorial was based on designs by pupils from Lowton West Primary School. Artist Emma Brown and pupils from Lowton West created the finished piece which is visible on this page. The memorial includes archive images of the men from the camp as well as alluding to the land the prisoners once used for exercise now being the site where Leigh East play rugby. 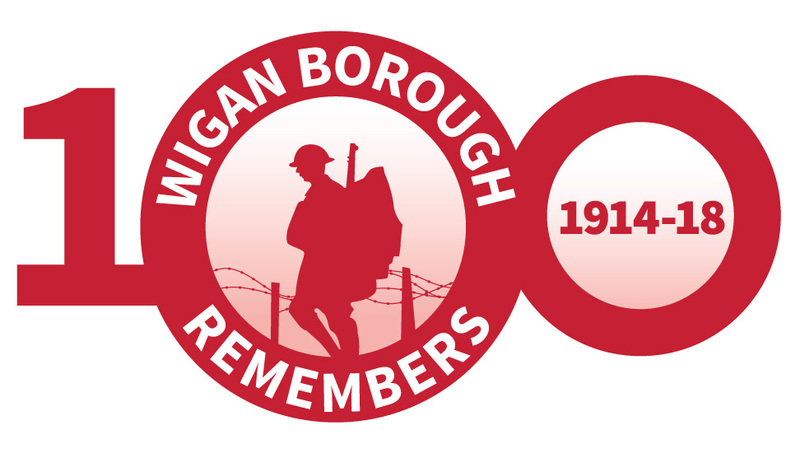 The memorial was funded by Wigan Council's First World War commemoration fund.